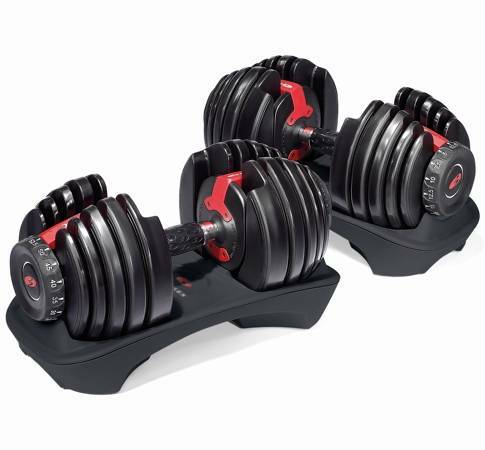 The Bowflex SelectTech 550 Dumbbell are very easy to use and has the ability to replace upto 15 sets of weights. This dumbbell has weight adjust from 5 to 52.5 lbs. The Bowflex SelectTech 550 Dumbbell are generally sold in pairs and helps in almost all form of exercises such as chest exercise, leg exercise, back exercise, arm exercise, Shoulder exercise etc. Weight Settings (lbs) - 5, 7.5, 10, 12.5, 15, 17.5, 20, 22.5, 25, 30, 35, 40, 45, 50, and 52.5 lbs. Money Back Guarantee– If your are not benefited with 6 week of contentious used you can send back the product and get back your full amount of money. Replaces up to 30 Dumbbells – with a turn of a dial you can automatically change your resistance from 5 lbs (2.27 kg) all the way up to 52.5 lbs (23.8 kg) of weight. Adjusts to Your Workout – adjust in 2.5 lb (1.13 kg) increments (up to the first 25 lbs) (11.3 kg) so you can gradually increase your strength. Wider Weight Range – with weight that adjusts up to 52.2 lbs., you’ll continue to see results as your fitness level improves. Space Efficient – One of the most space-efficient and flexible strength-training options available – say goodbye to 15 sets of dumbbells cluttering your workout space. Special Bonus FREE Bowflex SelectTech workout DVD – “Secrets of the 4 Step Rep” – with every purchase. Get the most out of your workout – work smarter, not harder. Over 30 exercises with over 80 variations. *Note: Most of the sites, stores or shopping portals listed above sell Bowflex SelectTech 552 Dumbbell with discounts and other exciting offers. There is a possibility that the some of above websites are not selling Bowflex SelectTech 552 Dumbbell now. Toughtrain.com is not liable for such cases or instances. Also we do not recommend any seller for Bowflex SelectTech 552 Dumbbell and a buyer should buy from where he/she gets best deal with quality of products, service and on time delivery (shipment).